Maybe I am making up for lost time as an adult since I never made it out of Cub Scout as a youth. While I enjoyed my 2 years in scouts during 4th and 5th grade, sports took precedent with me, when I moved into junior high I didn’t return to my pack. 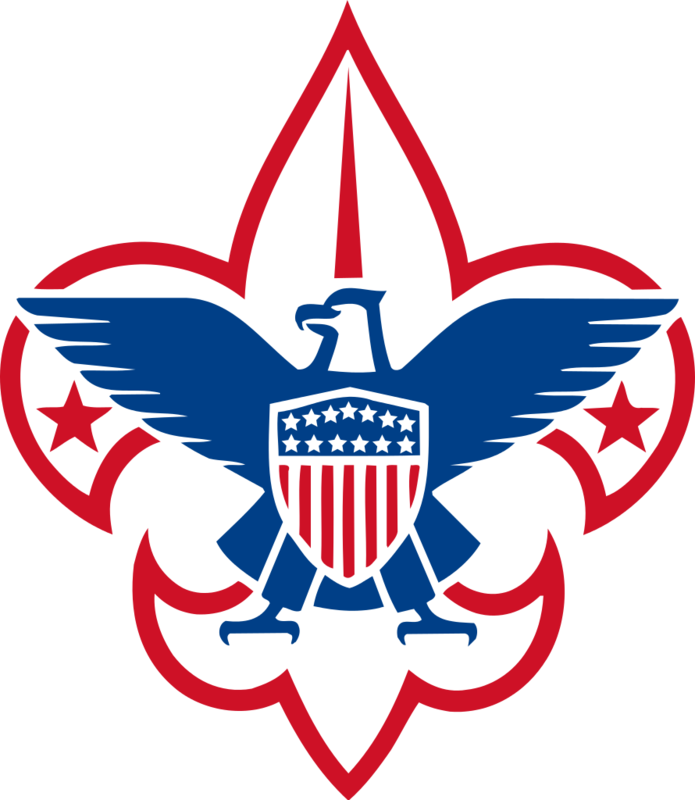 Now, 37 years later it appears I am making up for lost time, taking an active role in BSA Troop 93, located in Brentwood, California. Since March it’s been a busy transition period, learning how our troop functions, compared to that of a Cub Scout pack. With hours of leadership and training course now under my belt, I have years of scouting to look forward to. Spending 3 years at the Quartermaster in Pack 1155, almost 2 years as a Den Leader I crossed over with my son earlier this year to Troop 93 with the intention of becoming an adult leader. It seemed to be a natural progression. 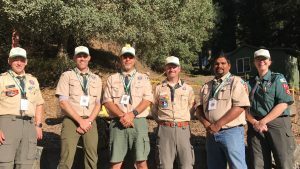 I knew the Scoutmaster and one of the assistants from my days in Pack 1155, but what I didn’t know was how the troop function. I had taught my boys the essentials of gaining their Scout badge in the last few den meetings we had to finish the scouting year. We built our Arrows of Light and each scout began a new journey. I felt I had a solid scouting background when my son and I joined Troop 93, but I felt like a fish out of water during the first few months. The Scoutmaster knew I wanted to be involved, but I didn’t take an active role, sitting back and watching how the leaders interacted with the boy led troop. I attended a committee meeting and was surprised at just how much work was coordinated behind the scenes. Unlike being a scout leader, committee duties looked too much like work. It took the Scoutmaster to approach me, before I got on board (unofficially) as an Assistant Scoutmaster. Spending hours on My Scouting, completing basic adult training, prepared me for some of the duties I would fulfill. Paperwork was filled out to become a Merit Badge Counselor for aviation, cooking, digital technology, game design, geocaching, personal fitness, personal management, radio, signals, signs and codes and traffic safety. I saw this as the “first step” in developing myself as an adult leader. With the exception of Summer Camp and canoeing at Don Pedro, I have attended all the camping trips this year. I have gained some practical experience while on these outings with the help of other adult leaders. However, I felt more training was required. It was my intention to enroll in Introduction to Outdoor Leadership Skills (IOLS) earlier this year, but it never fit in with my work schedule. 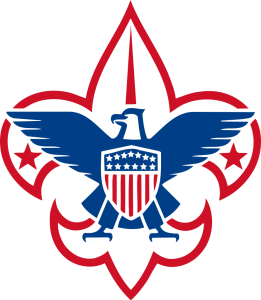 It would actually be Wood Badge (W3-23-17) that would indoctrinate me, driving me to “do my best” in life, as in scouting. Wood Badge was amazing! You can read my experience and that of our patrol, as we took flight at Camp Herms during our session. Last weekend I completed IOLS to finally earn the ‘Trained’ badge on my uniform. As a trained leader I look to the future and further training to make me stronger, more competent leader. Currently I have my eyes on becoming a Leave No Trace (LNT) trainer, as well as enrolling in some high adventure training (HAT). Now, after 6 months the boys have warmed up to me and I have found myself starting to help them in their rank advancement by signing off requirements. As part of my Wood Badge training, I wrote a few troop related tickets. The first was to give our long standing troop their own identity. With the consent of the adult leadership I put together a Troop 93 Logo Design Competition. Final submissions were taken last week and this Wednesday the scouts will vote on what design will represent them on the back of their neckerchief. In order to become more “involved” with the troop, another ticket had me take responsibility as the Merit Badge Coordinator, responsible for maintaining the up to date list of counselors for scouts in our troop. 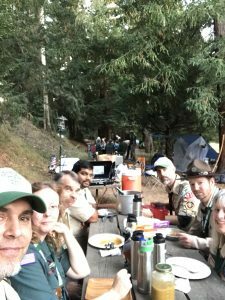 Another WB ticket was to facilitate a 20-mile hike for Troop 93, but with a few caveats. Three weeks ago we put in our hike to Los Vaqueros Reservoir, which took the better part of 7.5 hours, but 4 scouts finished the hike and were able to sign off their long hike for their Hiking Merit Badge. However, I am still short 3 items to complete this ticket, requiring attendance at the council roundtable, creating a flyer for distribution and inviting neighboring districts; Briones and Chief Solano. After discussing this with another patrol member from Wood Badge and consulting the Scoutmaster, this ticket might be amended with the approval of my Troop Guide. I would like to plan a 20-mile hike to be held annually, as an option to the Fages Hike that takes place in early June. 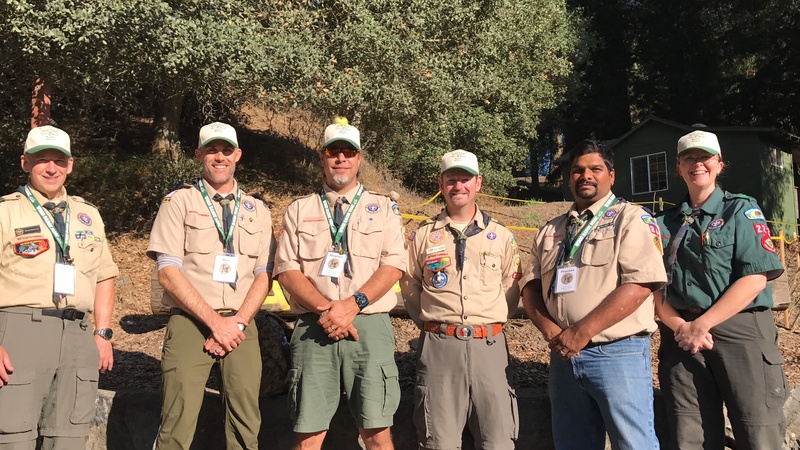 It would provide Scouts in the East Bay and surrounding districts a second opportunity to fulfill requirement 5 for their merit badge. It was also discussed that Troop 93 could sponsor the event, allowing the boys to manage aid stations along the 20-mile route. Lastly, I developed a program I nicknamed COAL or Crossover Orientation for Adult Leaders. 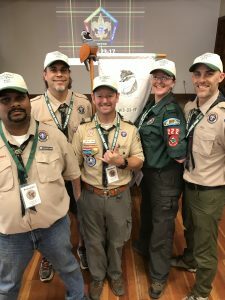 Not the most catchy of names, but it will allow new adults an overview of the troop, our expectations and give them a chance to get involved with Troop 93. There has been a good response from the adult leaders, as well as some of the committee members I have shared it with. Hopefully I will work with the New Member Coordinator to share this information with, as well as the new adults who will crossover to Troop 93 from Pack 1155. It was with great anticipation 37 participants returned to Camp Herms in El Cerrito to finish up their 6-day Wood Badge (W3-23-17) training. 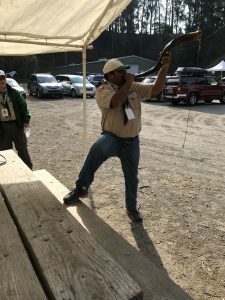 The first portion of the course was taught September 15-17, if you missed any of the excite, you can relive it by reading Wood Badge: Part 1. Being part of the Bobwhite patrol, we had teleconferenced twice over the break in order to plan our approach to the weekend, as well as finalize our patrol presentation, which could be seen as a “final exam.” This break between sessions as gave each of us individually, time to work on our “ticket items” that would be worked on after the completion of the course. Saturday started early, as campers started arriving prior to 7:00 AM in anticipation of hiking the rim to our camping area. The morning would actually begin once we finished the hike and began setting up our camp sites, down in the redwood grove. This meant the quicker we got organized we could depart on our hike. The Bobwhites were a bit tardy, as our final member arrived about 20 minutes late. But we donned our packs with a quick photo opportunity with Eric Gee before we set out. Along the hike we learned more aspects of Lord Baden-Powell’s military service, life and his service to boys, which would end up being the basis of scouting in the United States. The hike was just over a mile, but was to represent a 5-mile hike. It was a beautiful morning as the sun rose, lighting shining and shimmering through the trees. 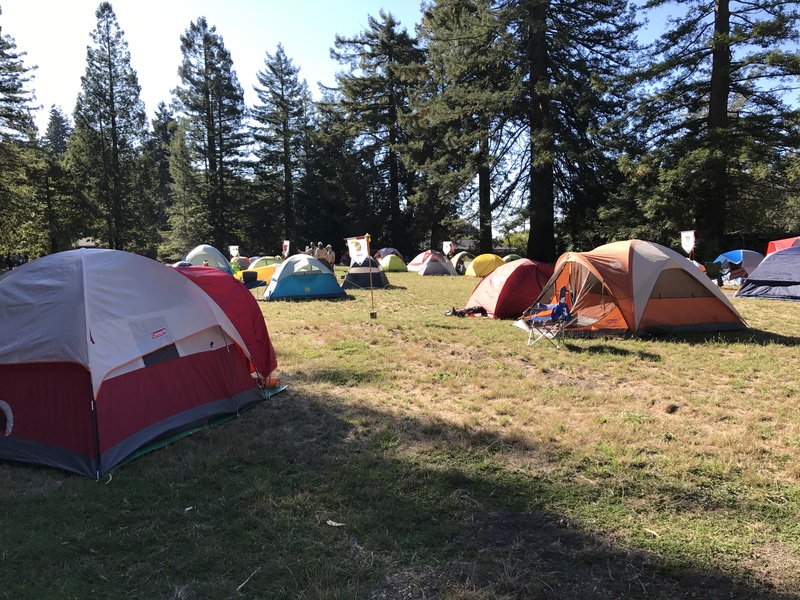 We wasted no time to set up camp when we dropped our packs on the large, grassy area, with Gilwell Field set up at the north end in preparation for our flags ceremony to open the weekend. Along with tents being pitched each patrol had to grab their stove, patrol box, propane tank and camp light, as we were assigned patrol areas, where we would meet and eat during the weekend. Our first presentation covered the Leave No Trace principles, which is what our patrol presentation would cover. We also watched Venturing crews put on a skit about the “model camp.” Leave No Trace also features as one of my ticket items to complete my Wood Badge. One aspect I found interesting with this weekend as opposed to our first was the fact we were last or late to many of the calls of the Kudu. It’s wasn’t our intention to regularly be tardy. While Patrol Leader on Day 4, I was conscious of times, sometimes I wonder if we, as a patrol tried to do too much, especially when it came to our meals.We had a great meal plan, as Praveen provide some excellent Indian food, but we weren’t able to completely clean our patrol site after lunch and it was quite disorganized when we returned hours later for our patrol meeting and dinner. This seemed to be a trend for the Bobwhites, one that was a bit frustrating at times, as I felt we led by example the month prior. Much of our training revolved around change, which isn’t necessarily a bad thing. We learned the value of change and developed skills to lead it successfully. We learned how to coach versus mentor and have an appreciation for leading change through lifelong learning. We also tackled problem-solving, which was shared with other patrols, some were successful, while others not so. In the end we learned valuable lessons. After lunch it was a presentation on Generations in Scouting by Quartermaster, Ken! We learned the generational differences as another aspect of diversity, considered how these differences impacted each group and finally, learned ways to work together across generations for a better future. It was another great presentation by our Wood Badge staff, whom we had grown to love and cherish for all they did. After getting an overview of problem-solving, patrols had the opportunity to solve a variety of different problems, given just 8 minutes for each. Thanks to the Venturing crews, they explained each problem and we, as a patrol had to solve it. Overall, we achieved a varying level of success over the 6 different problems. Given more time we could have been highly successful with 5 of the 6 problems, which required us putting principles we learned into action, practice teamwork and most of all HAVE FUN! Our final piece for the day dealt with managing conflict from a leadership point of view. 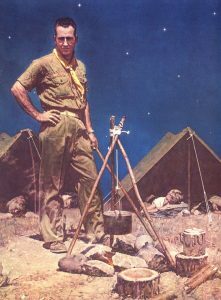 It opened with an image of Normal Rockwell’s painting, ‘The Scoutmaster’ where we saw a man deep in contemplation, his face serene and satisfied. Or was it? Our patrol meeting preceded dinner and we worked on our ticket items to share with Rand, our Troop Guide. I felt confident in where I was with my tickets, with just one questionable ticket, which would be resolved later with help. Dinner was amazing! Each patrol member doing their share of the work, while it was Praveen who took lead and fixed some great Indian cuisine for the Bobwhites to partake in. 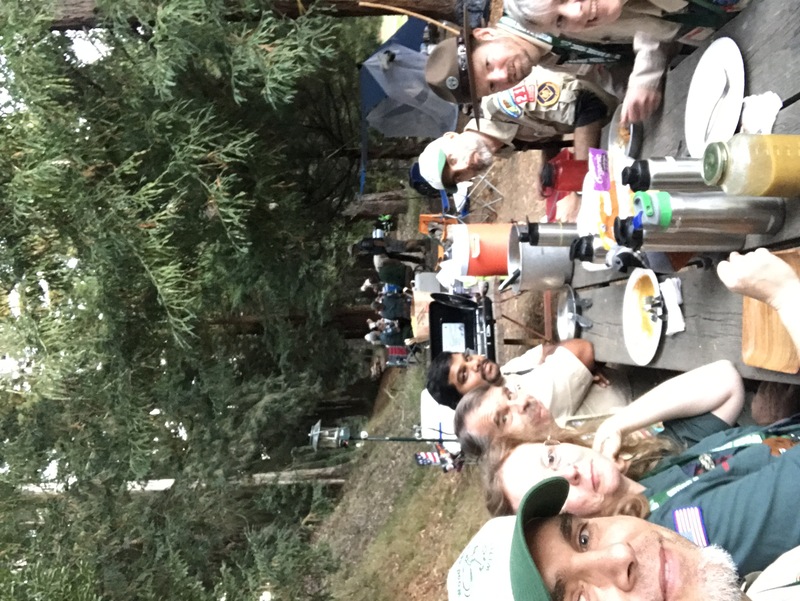 We had guests for dinner, just like we did for lunch and got to share stories and look at potential leadership opportunities at upcoming scouting events. I had the opportunity to talk to Debbie Roark, who is leading the next NYLT course at Camp Herms. I hinted I would be interested in being her Quartermaster for the week long event, time permitting of course. But it would be all the training leading up to the actual event, which would take away from my wife and son, as well as the obligations and responsibilities I have elsewhere in life. Still, I am keeping the door open for looking at this opportunity. Day 4 closed around around our eco-friendly campfire near Gilwell Field, as each patrol got to perform two skits. As a troop we shared laughs, promoted friendships and watched the performances in to the evening. The sun dawned on Camp Herms as it was leftovers for breakfast. As campers woke up, we took note of an early morning presentation on coaching and mentoring presented by Linda, who did a great job. We then had an opportunity to take the role of either Tom R. Sage, Venturing Legend or Megan Mecham. It was an interesting session going one on one in an attempt to resolve the problem. While I didn’t fail, I am not quite sure I succeeded, but from what I gathered in our wrap up discussion, I fared well. As a troop, we headed towards the Quarry to meet Shaun, caretaker of the camp. It was time for our conservation project, work that is always needed around the camp. For our group we would be removing brush, spreading wood chips, picking up firewood, painting, sweeping and repairing wheelbarrows. The next 2 hours were spent working these projects, our patrol was assigned high on the ridge to fill a trailer with firewood and pile up branches to be chipped. Prior to lunch it was a quick break and another presentation in the confines of the redwoods on self-assessment. The troop learned the importance of self-assessment in maximizing leadership potential. Self-assessment is also a valuable avenue for receiving feedback. Finally we built our own tools for self-assessment roles in Scouting and other leadership situations. Following lunch we returned to the grove for what we had been preparing for nearly the entire session, our patrol presentation. Our patrol was awesome! We came up with a few ideas, which were submitted during the first 3-day session and was approved by the troop leadership. Our topic dealt with Outdoor Ethics and the Leave No Trace principles. We used a scouting song as the basis of our skit to review the seven principles to LNT. The performance was awesome! Mike too lead as our guitar playing narrator, while Lisa donned wings and a plume as our magical Bobwhite angel. Praveen, Matt and myself took the roles of different scouters, continually being scolded by the angel, while the narrator attempted to explain each principle. After hours of sitting it was back to our patrol area, as each member spent time with the Troop Guide formulating their 5 ticket items in order to complete Wood Badge. The 6-days of class is only part of the experience. The 5 tickets require you to apply what you learn in order to achieve success. Thankfully my tickets were nearly complete, but they did (and still do) require some tweaking. In fact, as I write this, I might change one of them, after talking to the Scoutmaster in our troop. Our final night together but we were without guests. Troop leadership left us on our own after reviewing our tickets. It was interesting to see by this time, now 5 days in that patrols were starting to intermingle more with each other. Just that morning we were provided a troop yell, thanks in part to the Fox Patrol, who was acting as the Program Patrol. Amazing to think it took 5 days to come together as a single unit. The troop grew even closer that night as the Fox Patrol arranged and organized our own cracker barrel near the campfire. 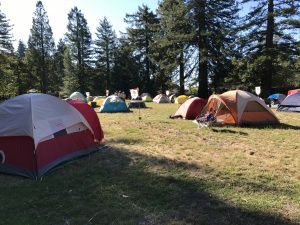 All the patrols took part as campers stood around talking, laughing and growing as Troop 1. It was an amazing night and it was unfortunate that the following morning would be our last together as a troop. Still many left that evening making a friend or two, with memories to carry home. 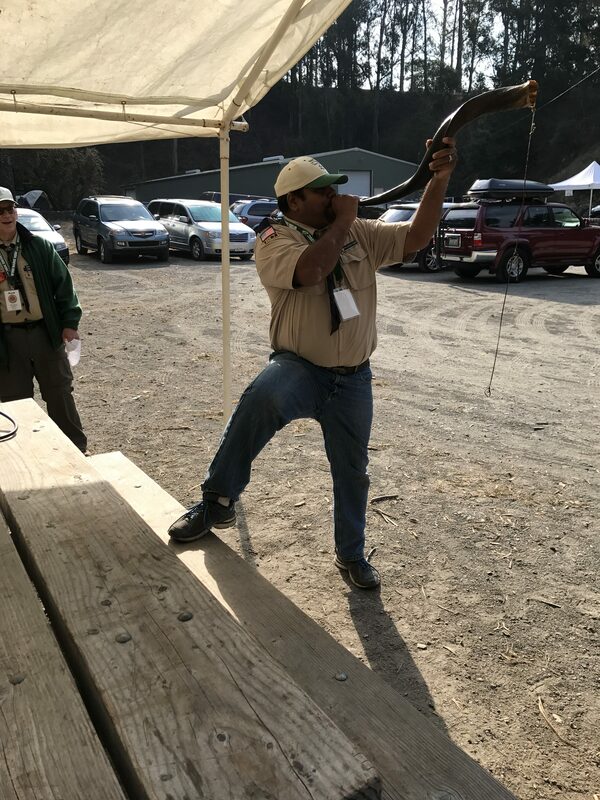 Day 6, our final hours at Camp Herms went by very quick, as the morning was remembered in part to the interfaith worship service provided by all the chaplin aides in the troop. While not a very religious individual, I am finding a new found interest and respect for faith and worship. This means I might be changing and growing as an individual and hopefully, as a leader. As we walked away from the service, it was time to break down camp in preparation of the Servant Leadership presentation. Servant leadership was summed up by Robert Greenleaf in 1970, “It begins with the natural feeling that one wants to serve, to serve first. Then conscious choice brings one to aspire to lead. The difference manifests itself in the care taken by the servant—first to make sure that other people’s highest-priority needs are being served.” We as adult leaders, leader to create more leaders, not followers. It was one of the best presentations, in my opinion to this point, but the best, most powerful was yet to be revealed. As noon approached the staff had the closing luncheon up at the lodge, as patrols made their way into the wooden room with troop leadership on hand, as the Quartermaster staff moved confident around in preparation for lunch. It felt good to be back in the lodge, where we first met. It would be the last time we gathered in there, together as Troop 1. The final two presentations discussed leaving a legacy and summarized the enter session. For me, Craig Mizutani developed a very powerful and inspiring message. This was not the first time he had done this. During the first 3-day session, his message about change surrounding the characters in the movie, October Sky really hit home and left me teary-eyed at times, as I reflected on my life, my spouse, co-workers. I never want to hear my wife tell me again, “you won’t change.” I can. I will. The message for me hit home and was very personal. Craig discussed setting priorities; family, work come as no surprise were the “big rocks” while things such as the Internet, social media and yes, even fantasy sports were nothing more than grains of sand and rather insignificant when compared to big rocks and pebbles (read rock, pebbles sand analogy). His words again cut right through to my heart, knowing in my mind I need to make changes to be the person I should be and not the one who I currently am. Change. Again, there was that word, if you don’t like something change it! He told personal stories and how individual’s in his life left a lasting legacy on him and those who came in contact. I feel Craig has left a lasting impression on me, not only as an adult leader, but as a father and a spouse. Surely his words won’t be lost as I go forward to complete my Wood Badge training. As 5:00 PM drew near, after the patrols had cleaned up the local around and the lodge, we gathered for one, final time at Gilwell Field. It was a somber mood, as Scoutmaster Laren delivered final words from the staff as our growth as Troop 1 over the 6-day course. It had been an amazing time. 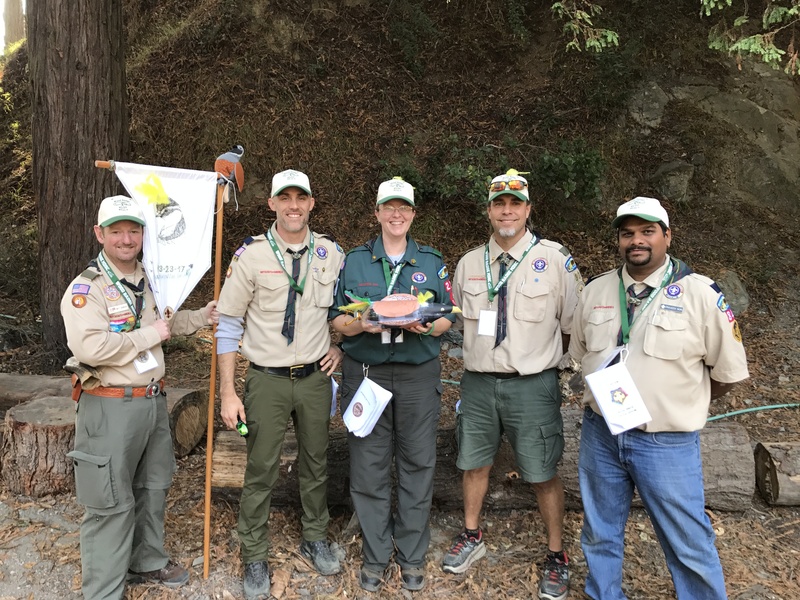 The flags were lowered, as the scoutmaster pulled the ax from the log and one final time asked that question, “Is there a beaver in the house…” This time each patrol was joined by staff based on their critter. Again, I found it tough to sing ‘Back to Gilwell’ as we truly had a wonderful time together. I’ve got some more personal thoughts in the next piece in the Wood Badge series. This past Friday I started down a path, on a journey to discovery. Entering my four year in scouting, after serving as Quartermaster and Den Leader for Pack 1155, Brentwood I took an active role as an adult leader when Zachary crossed over to Boy Scouts last year. While I probably led Zachary to Troop 93, I was excited at the leadership with Dr. Val Tompkins and Justin Aldridge, both from Pack 1155. Val served a dual role of Committee Chair and Den Leader, while Justin served as Assistant Cubmaster and Den Leader. It was their personal qualities, leadership style and enthusiasm, which brought us to join Troop 93 and for me to become involved as an Assistant Scoutmaster. The initial experience and transition from Cub Scouts to Boy Scouts was eye opening and I was caught off guard unexpectedly. I was lost when it comes to the structure of the troop, even though I knew the boys were the leaders, as the adults acted in a supervisory/mentoring capacity. While my transition was bumpy, there were lots of questions asked. I was constantly on the the PC, looking for information to add to my limited scouting knowledge, in order to enhance myself as a competent leader. Little did I know there would be training to come. The Wood Badge course consists of 6 days of training, divided up between two 3-day weekends. 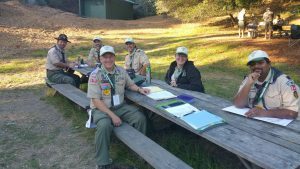 Camp Herms, located in El Cerrito was the setting for Wood Badge W3-23-17. That’s: W for Western Region, 3 for Area 3, 23 for Mt. Diablo-Silverado Council’s number, 23 for the year 2017. Steve Laren would act as the Scoutmaster for Wood Badge. Bobwhite Patrol, early on Day 1, coming together. It was with much anticipation I arrived a minutes past 7:30AM, Friday morning arriving at Camp Herms and directed towards “The Quarry” for parking. 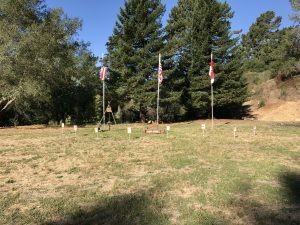 Every aspect at Wood Badge is organized and well structured; signage, stations numbers and a friendly, welcoming staff (I was greeted by Linda as I pulled up) broke some of the anxiety and anticipation I was feeling. As I made my way to the registration table and presented my name, I scanned to see if I knew anyone from the Brentwood troops. While I did spot a few familiar troops and packs, I knew no one a this training session. That…would be short lived as all participated placed into patrols for Wood Badge. One thing our patrol was not, was shy and elusive, as 5 individuals with varying background came together and formed the Bobwhite Patrol. One characteristic I noticed was the outgoing, positive attitudes of my teammates; Lisa Immel, Praveen Nori, Matt Schroder and Mike Oravec. We came together quickly to embrace our critter as the first day progressed. Catching and funny, it brought laughter throughout the troop, which helped break the ice, as patrols were introduced, friendships made. It wasn’t long after we started putting together more yells and our first song, sung to the tune, Barbara Ann by the Beach Boys. The morning session moved quickly as listening to learn took centerstage. The activity featured each cub working on making their first woggle. The group started out as Cub Scouts and by lunch time we were feasting our success at the Blue & Gold Banquet as we crossed over to Boy Scouts. Praveen Nori, Kudu in handle signaling the end of the training session. After learning how to listen in the morning session, we started to apply what we were learning to the afternoon discussions. The aims and methods of the BSA were introduced, as we were welcomed to Troop 1 by our Scoutmaster. With patrols already formed, it was time for patrol leader elections. Praveen Nori was our inaugural leader with Matt Schroder taking the assistant role. Lisa Immel’s calling was devine, fulfilling the role of chaplains aid for the entirety, while Stephen Toumi took quill in had as the patrol scribe. Mike Oravec was our scout without a dedicated role in the Bobwhites, but each patrol member had an integral part to play for troop success. After a great dinner put together by the troop quartermaster staff, there was a bit of free time before the night’s campfire. 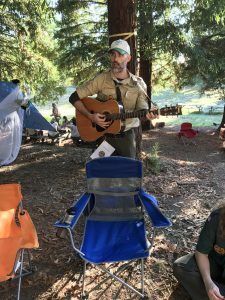 As the last light faded over the horizon, scouts gathered in the quarry for song, skit, camaraderie and a night full of activity and information. Day 2 arrived early, as patrol members made their way down the hills to the lodge for breakfast and to share thoughts and ideas. The morning was crisp and the weather rock told us there was no rain in sight, so it was our time to shine. The Bobwhite Patrol was selected (Gilwell Order) to be the Program Patrol, passed on from the Beavers. If you ask any Bobwhite B-Dubber, we took the program to the next level and set a very high bar for those patrols to follow. We got started with song early in the morning, as leadership wanted pictures of all the patrol and staff. Together we combined for about 8 songs within the 90 minutes of the morning. Mike Oravec received the Kudu and blew the horn to start the days activities. Praveen Nori patched Matt Schroder as Patrol Leader for the day. The morning session taught us about leveraging diversity through inclusiveness. We started with a Zulu Toss game, in which individuals worked together as a team in an attempt to keep 6 tennis balls moving through the group. The Bobwhites achieved 5 balls in the air, but just missed out on that 6th ball. After discussing the Scout Oath and Scout Law, how we should live by and promote these principles in our own lives, as well as those scout we lead, we moved on to another morning activity. Each member had the opportunity to set up and light a portable stove. After some equipment checks, those who had not set up a stove before were able to do. After a short discussion, it was back to lodge to see what we were most afraid of. It really came as no surprise that the top fear, as a nation was speaking in front of a group. Many patrols recognized this as a fear, myself included. It’s interesting to note that I have been willing to step up more, leading in song and yell, as part of our responsibility of the Program Patrol. In order to take advantage of the training, you must shed your fears and hesitation and fully participate as a member of the patrol and the troop, a quality that is bound to make a good, confident leader. It was back to another game called Front End Alignment, where are Matt, our patrol leader attempted to derail the troop. There was a 15′ piece of blue plastic with a bucket at the end. The object for 3 members of the patrol to throw, three pieces of candy into a but from varying length. While the rules weren’t fully clear, we interpreted the rules the Bobwhite way and someone picked up the bucket in order to catch the candy. Matt however, was dead set on re-reading the rules in an attempt to deter us from our plan. His type ‘B’ management style (dictatorship) failed, as he couldn’t impose his will on us as a group. In the big picture, those 4 patrols with type ‘A’ patrol leaders outscored and fared better than our group. After lunch there was a quick discussion on our project and how to plan for the second weekend, when we implement what we had learned. Our patrol discussed a few ideas, but we seemed to agree upon a project that centered about Leave No Trace. While not a BSA sponsored program (BSA moving to Outdoor Ethics), they have adopted it as part of the training curriculum. As a patrol we wrote up a proposal, which would be submitted to the Scoutmaster for approval. Bobwhite Patrol prior to lift off of the S.S. Roberto Blanco! The afternoon project was build and launching water propelled bottle rockets into the bright, blue sky. Patrols were giving 60 minutes to design and build their rocket using varying art supplies. The Bobwhite Patrol decided to pay homage to the ground bound bird that brought us together, the bobwhite. Dubbed the S.S. Roberto Blanco, we walked to the launch site, rocket in hand. In Gilwell Order, we were the second patrol to launch our rocket. The rocket performed admirably, as Lisa Immel was tasked as the launch director, filling the rocket with propellant (and glitter) and then lighting the fuse or in this case pulling the pin. The rocket performed magnificent as the launch went off without a hitch, as Roberto Blanco rose in the afternoon sun. We figure it achieved a height of 50′-60′ feet before turning back for its decent back to Earth. Our patrol was overjoyed and celebrated success with our rocket, while the staff, dressed in pirate garb scored us in the mid 7 to 8 range, out of 10. When awards were handed out, we received the Scour Spirit award and felt it was fitting, as we had been keeping up song and yells as the Program Patrol. The evening activity was interesting with back to back games featuring the Wood Badge Game Show, formed around the popular TV game show, Jeopardy. This was followed by a special guest and a game called The Game of Life (aka Win All YOU Can). These two game seemed to highlight where each patrol and the troop was overall. The leaders of Troop 1 continued to talk about patrol competition, reminding us that we were attempting to act as a troop. Stressing putting aside individual patrol achievements for the sake of the patrol. Not sure the message was completely received. The most important event of the evening was The Game of Life, as taught to us by a special guest from San Diego, a long time friend of Scoutmaster, Steve Laren. His energy was outstanding! The game was simple, with simple instructions and just 2 cards; beads and a log. Teams were required to hold of the two cards up. Many were mystified as to the scores in the first 3 rounds, but at the start of the 4th round, patrol leaders were called together in order to work as a team. Returning to patrols, we attempted to implement our plan. Unfortunately, the Foxes didn’t completely follow directions, which was met with a sigh from the other three patrols. By the end of round 7, patrols understood the game, but there was much frustration throughout both sides of the room (4 patrols made up 1 team). Some were frustrated to the point of looking upset and calling out the offending patrols. In the end, the scores were irrelevant, as the the object of the game wasn’t “win all you can.” After discussion lead by our special guest, the title of the game could be changed to “you all can win!” In order to make this happen, which it did as teams scored 5000 and 4000 points respectively. The rules and idea of how the game was played changed midway through as teams realized how to work together in order to achieve for their patrol and team, eventually the entire troop. The final day of the first weekend was short, as we were planning on departing by 5PM. After breakfast, thanks again to the great quartermaster staff, we assembled at Gilwell Field for flags and morning announcements. The Bobwhite Patrol gave one last blow of the Kudu as we passed on the responsibility to the Fox Patrol. We pinned Mike Oravec as Patrol Leader, while Stephen Toumi became the assistant. Praveen Nori took over scribe duties.. Morning lecture too place at the fire pit in the way of an instructional interfaith worship service. Lecture, prayer, song dotted the morning as we, as leader learned how to run a successful service on Sundays. At the conclusion of the service it was back to the lodge for a troop meeting, where we learned about the Learning EDGE and the Teaching EDGE, which built on the stages of team development. The day was half over when lunch time arrived, things were about to get busier. After lunch the patol leaders had their daily PLC meeting, while the chaplin’s aides met as well, leaving the remaining scouters in their patrols, where they were left to work on their mission and vision statements in preparation for their 5 tickets items. For me, I turned to Rand Mahoney, our Troop Guide, as I found how he chaired the JOTA/JOTI event for the MDSC at Pacificon in October. This amateur radio event is to introduce scouts to the wonders that are amateur radio, communicating with scouts locally and worldwide. It was mentioned that helping to setup and run the event in 2017 and potentially lead the event next year would fulfill a ticket. I also began brainstorming leadership ideas to take back to Troop 93 in Brentwood. Being named as the Merit Bade Coordinator, I am hoping to slide by with an “easier” ticket, as the merit bade counselors need to be updated in order to provide leaders to train our boys. Other leadership ideas included some form of transition training for leaders crossing over with their sons from Cub Scouts to Boy Scouts. Taking it from personal experience, I was left with many questions and not many immediate answers. With October quickly approaching, our SPL of Troop 93 put a call out for letters in from those boys interested to be the next SPL. Unfortunately, no one responded, which leaves the boys without an incoming leader and the adults left to decide the next move. What I would like to see is some sort of parallel training moving forward, where you could have an extra boy (or two) attend some SPL meetings to see what takes place in order to prepare these boys for their time as SPL or any other leadership position. L to R: Rand Mahoney, Mike Oravec, Stephen Toumi, Matt Schroder, Praveen Nori, Lisa Immel. Bobwhites before the closing flag ceremony. The same can be said for the adult leadership. We have a great Assistant Scoutmaster in Justin Aldridge. While I applaud him for his military service in the U.S. Coast Guard, his posting could be up inside of 2 years and he and his boys will be moving on. While this wouldn’t necessarily leave us without an assistant (we have 4 others, including myself), he is a wealth of information and experience, as well as a confident leader. His words of wisdom to the troop would be missed. Other ideas include giving back as a part of the staff at LEAD, NYLT or Wood Badge. Guess my name could end up on a few lists at the completion of our course. However, at this time I could not see myself in that high profile of a leader position. Maybe I am selling myself short and I could do, we will see how my 5 ticket items come together in the next few weeks after I meet with Rand Mahoney. The staff presented the conservation project we, the scouters will be working on when we return to Camp Herms. We heard from Sean, the park ranger at the camp, as he discussed what we will be doing in order to clean up parts of the camp, as the scouts are the one to maintain the facility. The remainder of the afternoon consisted of watching the film October Sky, based off the book, Rocket Boys. “This movie is based on the first memoir in a series of three, by Homer Hickam, Jr. It is a story of growing up in a mining town, and a boy’s pursuit of amateur rocketry in a coal mining town.” More than a great story, its a chance to watch and examine how people apply skills of leadership, as seen from Homer, as well as his father, John. Both individuals have aspirations and dreams and their visions evolve and change as the movie progresses. Aside from being a touching movie, it echoed with many things we had learned over this first weekend. More important, as highlight by SPL, Craig Mizutani as I began to reflect on the training personally, by observing traits in others, it is easier to improve traits in ourselves. That means change CAN happen on ALL levels; being a better person, a better leader, better friend, better spouse. I am not to afraid to admit I was a bit teary eyed at the end of this discussion and for the first time felt empowered to make change in my life on many levels.